The cultural blend and diversity of Spain is what makes it so interesting, from the capital Madrid with its abundance of museums to Barcelona full of Gaudi’s architecture to the coastal areas with beautiful beaches, you’re sure to find something to see and do in Spain. Revel in a relaxed lifestyle, get obsessed with food and wine, have an afternoon siesta, partake in their all night parties with vibrant music and dance and appreciate its incredible architecture, charming cities and diverse landscapes. Spain is waiting for you. Spain is truly a melting pot of culture with its influences evident in its architecture, languages and landscapes. Visit its beaches, be impressed by its incredible architecture, drink its wine, eat tapas and be inspired by this incredible country. We have packages tailored to all needs and budgets. The below is just a handful of featured trips, so contact us to discuss your dream holiday. 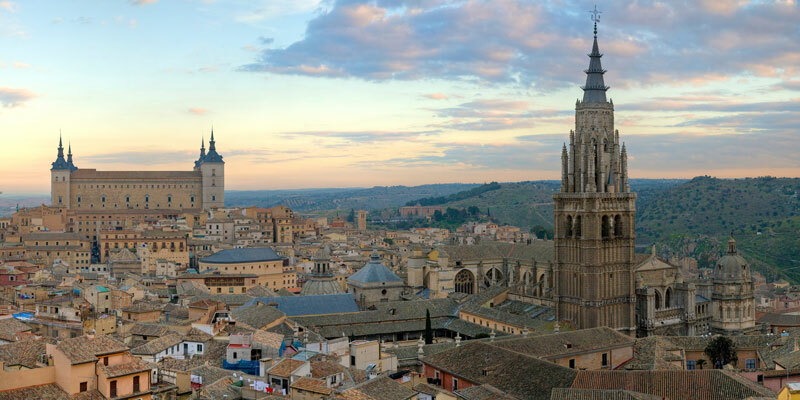 A municipality located 70 km south of Madrid, Toledo has been declared a UNESCO World Heritage Site due to it being dubbed the ‘City of Three Cultures’. Christians, Muslims and Jews co-existed in this city for centuries and you’ll feel like you’ve been transported to the past in this historical city full of stone buildings, cobblestone streets palaces, churches, mosques, synagogues, fortresses and much more.